We are the leading manufacturer, exporter and supplier engaged in a wide assortment of Kraft Paper Bag Extrusion Coating Machine. Our offered lamination plant is manufactured keeping in mind the industry norms by using advanced techniques. Furthermore, this lamination plant is equipped with preheating roll (optional) for preheating and drying of substrates. Offered lamination plant is available in numerous specifications to choose from. We are the leading manufacturer, exporter and supplier engaged in a wide assortment of Extrusion Woven Fabric Lamination Machine. Our offered lamination plant is manufactured keeping in mind the industry norms by using advance techniques. Furthermore, this lamination plant is equipped with preheating roll (optional) for preheating and drying of substrates. Offered lamination plant is available in numerous specifications to choose from. We are the leading manufacturer, exporter and supplier engaged in a wide assortment of Extrusion Lamination Machine. Our offered lamination plant is manufactured keeping in mind the industry norms by using advance techniques. Furthermore, this lamination plant is equipped with preheating roll (optional) for preheating and drying of substrates. Offered lamination plant is available in numerous specifications to choose from. 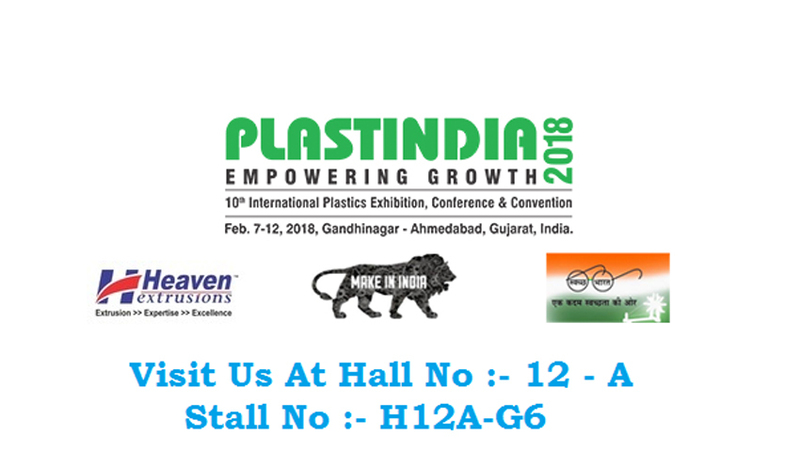 We are the leading manufacturer, exporter and supplier engaged in a wide assortment of Polyester Film Extrusion Lamination Machine. Our offered lamination plant is manufactured keeping in mind the industry norms by using advance techniques. Furthermore, this lamination plant is equipped with preheating roll (optional) for preheating and drying of substrates. Offered lamination plant is available in numerous specifications to choose from. We are the leading manufacturer, exporter and supplier engaged in a wide assortment of Lamination Machine for Rice Bag BOPP plant. Our offered lamination plant is manufactured keeping in mind the industry norms by using advance techniques. Furthermore, this lamination plant is equipped with preheating roll (optional) for preheating and drying of substrates. Offered lamination plant is available in numerous specifications to choose from. We are the leading manufacturer, exporter and supplier engaged in a wide assortment of Woven Sack Fabric Coating Machine. Our offered lamination plant is manufactured keeping in mind the industry norms by using advance techniques. Furthermore, this lamination plant is equipped with preheating roll (optional) for preheating and drying of substrates. Offered lamination plant is available in numerous specifications to choose from. We are the leading manufacturer, exporter and supplier engaged in a wide assortment of Extrusion Coating Lamination Jumbo Bag Mach. Our offered lamination plant is manufactured keeping in mind the industry norms by using advance techniques. Furthermore, this lamination plant is equipped with preheating roll (optional) for preheating and drying of substrates. Offered lamination plant is available in numerous specifications to choose from. Fuma multi-function BOPP Film with Woven Fabric Extrusion Lamination Plant is developed continuously by ourselves, based on our production experience of more than Fifteen years. 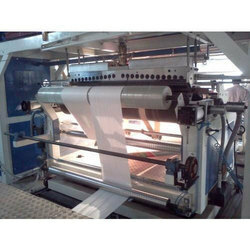 BOPP Film with Woven Fabric Extrusion Lamination Plant is characterized by advanced technique, reliable quality, easy to operate, and high automation, which is used widely in the industries of chemical, petrochemical, cement, sugar, salt, Grain and wheat, Animal feed, Commodity items, metallurgy and mining and general purpose packaging, storage and transportation of many kinds of materials. The BOPP Film Lamination Extrusion coating laminating Plant uses PP or PE as raw material, through the flow-casting coating and lamination technology, achieving single-sided / double-sided coating or paper-plastic lamination with substrates (plastic woven fabric), to produce coated or laminated products. 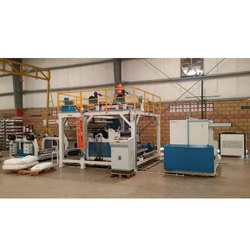 The BOPP Film Lamination Extrusion coating laminating Plant is equipped with advanced electrical and mechanical devices throughout the whole production flow from substrate unwinding, lamination to winding, to achieve single control and group control. 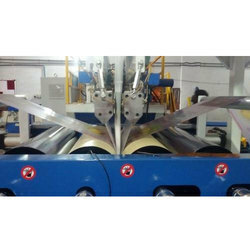 The BOPP Film Lamination Extrusion coating laminating Plant dual-station Unwinder uses automatic web guiding control for substrates, and brakes for surface tension control of substrates, achieving pneumatic splicing and non-stop roll changing. The BOPP Film Lamination Extrusion coating laminating Plant laminator is equipped with preheating roll (optional) for preheating and drying of substrates. Laminating roll, silicon rubber roll and press roll are of dual-interlayer forced water cooling structure, with excellent cooling effect. The BOPP Film Lamination Extrusion coating laminating Plant dual-station winder adopts constant-tension surface friction winding, pneumatic transverse cutting, roll changing without shutdown, and equipped with adjustable edge-trimming device, edge-strip blowing device, and length counting device. We are the leading manufacturer, exporter and supplier engaged in a wide assortment of BOPP Double Extrusion Coating Plant. Our offered lamination plant is manufactured keeping in mind the industry norms by using advance techniques. Furthermore, this lamination plant is equipped with preheating roll (optional) for preheating and drying of substrates. 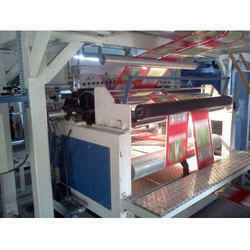 Offered lamination plant is available in numerous specifications to choose from. HEAVEN multi-function Bopp Film Sandwich Lamination Plant is developed continuously by ourselves, based on our production experience of more than Fifteen years. Bopp Film Sandwich Lamination Plant is characterized by advanced technique, reliable quality, easy to operate, and high automation, which is used widely in the industries of chemical, petrochemical, cement, sugar, salt, Grain and wheat, Animal feed, Commodity items, metallurgy and mining and general purpose packaging, storage and transportation of many kinds of materials. The Bopp Film Sandwich Lamination Plant uses PP or PE as raw material, through the flow-casting coating and lamination technology, achieving single-sided / double-sided coating or paper-plastic lamination with substrates (plastic woven fabric), to produce coated or laminated products. The Bopp Film Sandwich Lamination Plant is equipped with advanced electrical and mechanical devices throughout the whole production flow from substrate unwinding, lamination to winding, to achieve single control and group control. The Bopp Film Sandwich Lamination Plant dual-station Unwinder uses automatic web guiding control for substrates, and brakes for surface tension control of substrates, achieving pneumatic splicing and non-stop roll changing. The Bopp Film Sandwich Lamination Plant laminator is equipped with preheating roll (optional) for preheating and drying of substrates. Laminating roll, silicon rubber roll and press roll are of dual-interlayer forced water cooling structure, with excellent cooling effect. 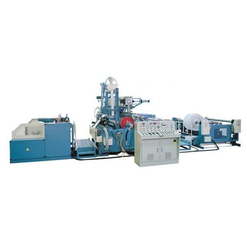 The Bopp Film Sandwich Lamination Plant dual-station winder adopts constant-tension surface friction winding, pneumatic transverse cutting, roll changing without shutdown, and equipped with adjustable edge-trimming device, edge-strip blowing device, and length counting device. HEAVEN multi-function Woven Sack Bag Lamination Plant is developed continuously by ourselves, based on our production experience of more than Fifteen years. Woven Sack Bag Lamination Plant is characterized by advanced technique, reliable quality, easy to operate, and high automation, which is used widely in the industries of chemical, petrochemical, cement, sugar, salt, Grain and wheat, Animal feed, Commodity items, metallurgy and mining and general purpose packaging, storage and transportation of many kinds of materials. The Woven Sack Bag Lamination Plant uses PP or PE as raw material, through the flow-casting coating and lamination technology, achieving single-sided / double-sided coating or paper-plastic lamination with substrates (plastic woven fabric), to produce coated or laminated products. The Woven Sack Bag Lamination Plant is equipped with advanced electrical and mechanical devices throughout the whole production flow from substrate unwinding, lamination to winding, to achieve single control and group control. The Woven Sack Bag Lamination Plant dual-station Unwinder uses automatic web guiding control for substrates, and brakes for surface tension control of substrates, achieving pneumatic splicing and non-stop roll changing. The Woven Sack Bag Lamination Plant laminator is equipped with preheating roll (optional) for preheating and drying of substrates. Laminating roll, silicon rubber roll and press roll are of dual-interlayer forced water cooling structure, with excellent cooling effect. The Woven Sack Bag Lamination Plant dual-station winder adopts constant-tension surface friction winding, pneumatic transverse cutting, roll changing without shutdown, and equipped with adjustable edge-trimming device, edge-strip blowing device, and length counting device.